vCentre Linked Mode (VMworld ’09) – well worth a watch! Simplify administration – in large environments this prevents administrators having to open multiple VI client sessions to multiple vCenters as all administration can be done through a single session. Geographical or organisational boundary – if the infrastructure is split across a large geographical area latency could be an issue if the vCenter server is remote to some hosts. 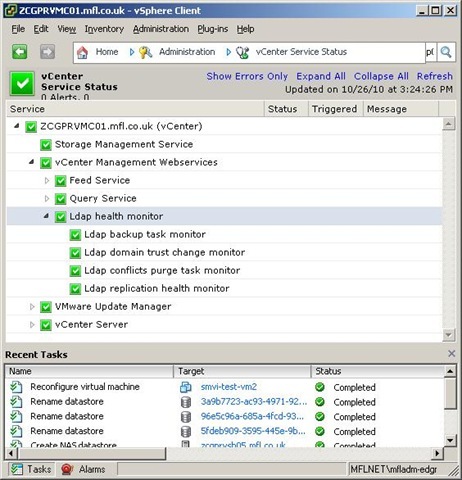 In this case locating a vCenter onsite and using Linked Mode may improve performance. NOTE: Linked Mode can’t be used to move VMs or ESX hosts between vCenter instances – it’s view and search only. The above limits could be an issue for VDI deployments (lots of VMs per host). NOT designed as a DR solution. VMware vCenter Server Heartbeat is the official DR product for vCenter, and SRM is the official DR product for protecting VMs. Licences are shared between all linked vCenter instances so you can’t stop someone at one site using any licence in the licencing portal. Server compatibility is same as for vCenter. Time synchronisation within 5 mins (Kerberos authentication). User installing Linked Mode must be local Admin on both vCenters servers being linked. When vCenter servers are in multiple domains there must be two way trusts between domains. Only included with Standard edition (not in vCenter Foundation edition). Both I and people on the VMware communities site have had no problems running vCenter 4.1 and linking to a vCenter running v4.0, though not sure if it’s officially supported. UPDATE: Having deployed this in production I can say that running mixed versions is supported (it’s listed in the 4.1. release notes) BUT does have its issues – see VMwareKB1026346. It also requires an update to the VI client so you have both v4.0 and v4.1 installed. There’s a good blogpost describing the problems and solution (upgrade to v4.1!). Linked Mode works with SRM and is compatible with vCSHB, but has limited compatibility with VMware Data Recovery. See the Data Recovery FAQ for details. There are two ways to enable Linked Mode. You can choose it during vCenter installation (assuming you already have at least one vCenter server built) or you can configure it at a later date using Start -> Programs -> VMware -> vCenter Server Linked Mode Configuration. The process is almost identical to joining a Linked Mode group. Go to Start -> Programs -> VMware -> vCenter Server Linked Mode Configuration but choose the ‘Isolate this vCenter server…’ option instead of the ‘Join…’ option. The vCenter Server restarts (the service, not the OS) and is no longer part of the Linked group. This is when roles defined at one vCenter server clash with the same role as defined on another vCenter and Linked Mode is used. For example if the Virtual Machine Administrator role is amended on one vCenter server (while in standalone mode) and it’s then put into Linked Mode. As the same role has two conflicting definitions a conflict arises. As stated in the requirements section, time must be in sync across all vCenter servers (within 5 mins). If not (according to VMware KB1009551) there will be no obvious errors but replication will stop working. If the user installing vCenter is not an administrator on both the source and destination vCenter servers the install may appear to complete OK but won’t work as expected – see VMware KB1016144 for details. Check the ADAM service is started (named vCMSDS) – this becomes a dependency for vCenter when Linked Mode is enabled. 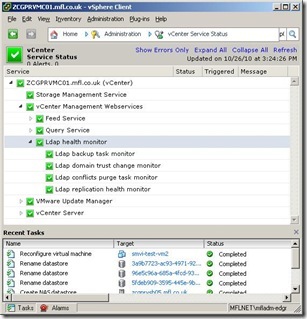 You can restart vCMSDS service without impacting any running operations (VM clones etc).